Brucellosis presents an overview of the conditions associated with the subject matter. It discusses the disease of protean manifestations affecting all types of tissues and organs in the body. It addresses the different facet of the disease studied in isolation. Brucellosis is a zoonotic disease common around the world. 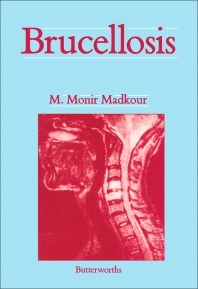 Some of the topics covered in the book are the historical origin of different species of Brucella strain; epidemiological features of brucellosis; occupational hazards of working in the meat processing environment; identification and taxonomy of bacteria carrying the Brucella strain; and methods for the identification of cultures. The pathology and immunology of brucellosis in humans are fully covered. The histopathological aspects of the brucella organisms are discussed in detail. The text describes in depth the cardiovascular complications of the disease. The diagnosis of brucella thrombophlebitis is completely presented. A chapter is devoted to the respiratory and gastrointestinal manifestations of brucella organisms. The book can provide useful information to veterinarians, doctors, chemists, students, and researchers.